Concept car heralds new electric small SUV. Promises 279-mile range when it launches in 2020. Shown at the Geneva Motor Show. 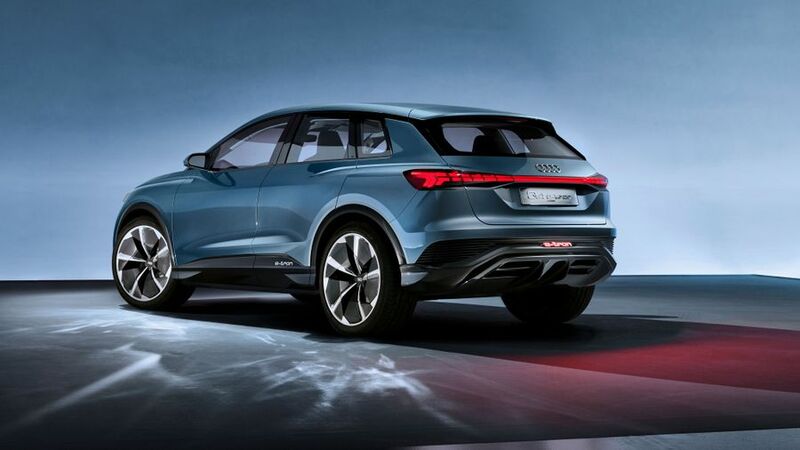 This is Audi’s Q4 E-Tron concept, and aside from a few show-offy bits, it’s the production electric small SUV that you’ll be able to buy from the end of 2020. Shown at the Geneva Motor Show, the all-wheel drive SUV has a range of 279 miles, and a sprightly 0-62mph time of 6.3 seconds. It’s powered by an 82kWh battery and two electric motors – one for the rear wheels and one for the fronts. When it comes out, it’ll be the fifth all-electric vehicle in the Audi range. Owners can recharge to 80% in around 30 minutes, with a maximum charge of 125kW. Audi promises a spacious interior and plenty of technology through a 12.3-inch infotainment screen and a digital instrument display in front of the driver. The styling is influenced by the larger Audi E-Tron, which is already on sale. The Q4 will be a similar size to the current Q5. Check out our full run down of everything at the 2019 Geneva Motor Show.